LED Lenser X21 Flashlight - This thing is a beast. Extremely reliable and bright. I use it all the time for all sorts of reasons. Definitely worth the investment. The X21 is that it is a continuous lighting solution, not a short burst of light like flashes are. 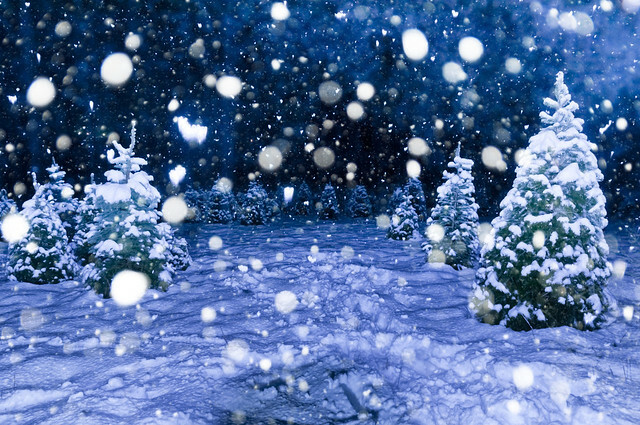 Continuous lighting lengthens motion, flashes freeze motion. Nikon D300s DSLR - This is just the camera I use. ANY DSLR can produce the results you see in the video. Sigma 17-50mm f2.8 Lens - I use this lens for pretty much all of my work. Manfrotto 055XPROB Tripod with Manfrotto 496RC2 BallHead - Mounting your camera to a tripod is absolutely essential in order to eliminate camera-shake. Optional: You can mount the X21 to a tripod by using an X21 tripod mount. 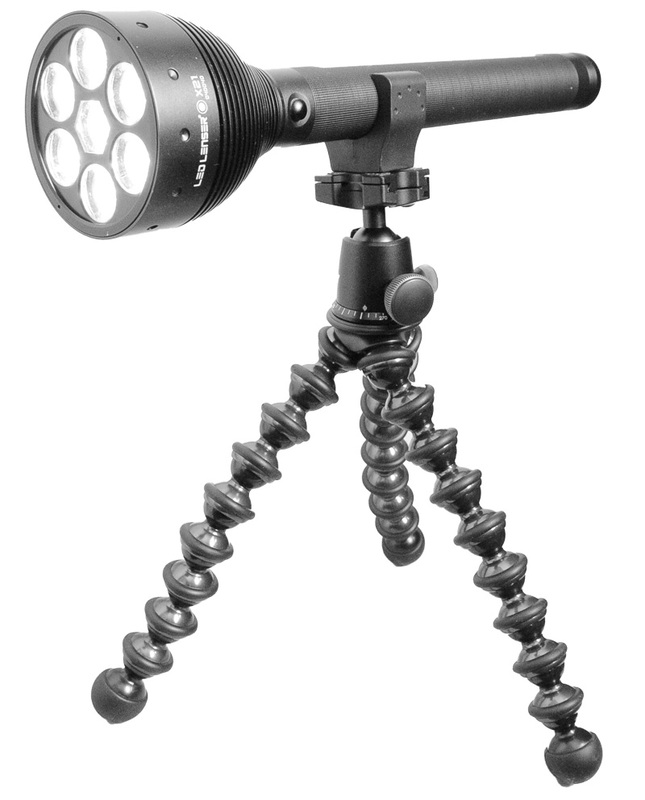 When I was outside, I didn't want to lug around two big tripods for both my flashlight and camera, so I conveniently mounted the X21 to the Joby GP8-BHEN Gorillapod Focus with Ballhead X. Another idea I got only after it was done snowing would be to take a ~1 second exposure of the on-camera flash in burst mode, where it flashes rapidly multiple times. I'd love to try it at different speeds and show the results, I'm definitely thinking the faster speeds would look best. If you have a camera that has a burst flash mode feature - remember to try this idea and post your image in the PhotoExtremist Flickr Group or on Facebook. 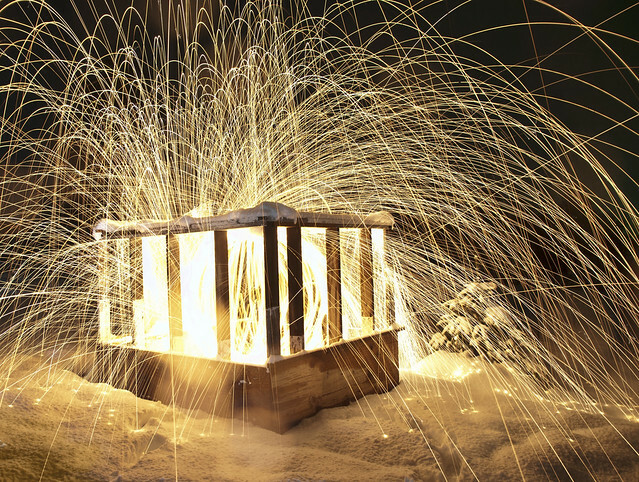 And of course, if you are wondering how the photographs of those flying sparks were created, take a look at my Steel Wool Photography Tutorial and I'll show you how to do it! Are you tired of taking boring photos of the same mundane subject matter? Wouldn't you rather take your photography to the next level and photograph things that catch people's attention? 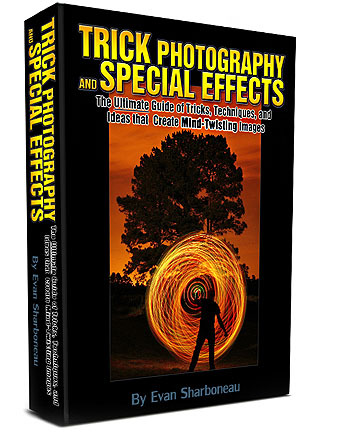 If you would like to get the complete scoop and learn how to take more creative and unique shots with your DSLR, pick up my Trick Photography and Special Effects e-book and video course today! Awesome work Evan! Greetings from warm India (no snow here I’m afraid!). Didn’t the snow screw with you D300? I’m always worried about getting the camera wet — I try and put a plastic bag over my D700 when I’m shooting in a light drizzle. I am beyond impressed with the ‘Extreme’ creative niche you have carved out for yourself! I love engaging the lessons you share, as you are an inspirational teacher over flowing with high-energy, excitement and passion; you certainly appear in alignment with your purpose, adding to the quality of the trainings you provide! Your book (Trick Photography and Special Effects) as well as the never-ending video series (Yay me and … Thank you!) is filled with awesome information and resources! You are, as they say, ‘wise beyond your years;’ well, except perhaps not so much in the area of avian creatures (“a bird-thing”—I love it!). I am thankful for all the informative and fun trainings that you so joyfully share with the world! May you and yours experience abundance beyond your wildest dreams just as you so bless others with your gifts –as he/she/ or they cross your path! And SO it IS! photography, I just need the time to take it all in and try to reproduce some “great things” too. I live in Australia and where I am we do not have any snow but, I might go back to UK for a visit when Winter is on and, may be, just may be, I could use your lesson on Effects in the snow. Thank you for your courses and many tips. I hope take one picture that is 50% of yours i am hapy. Great! great! and thanks for sharing. amazingly awesome!thanks for sharing this new knowledge.keep up the good work! G’day Evan, Thanks a million for all your tutorials, they are fabulous, and I am learning heaps. I’m from Australia and we are off to the snow fields this winter, can’t wait to try these things out! Thanks again for all the effort you go to. The tutes are very easy to understand and my pics have improved heaps thanks to you. I do a lot of lightpainting and have been looking at some of the really powerful flashlights in hopes that I might get away from using my flash gun all the time. The number of options is boggeling. Why did you choose the LED Lenser X21? Snow forecast for tomorrow so I might have a chance to play. BTW that torch is SERIOUSLY expensive! It is really tough and reliable. What other ones have you seen that have 1000 lumens? can i ask what model of nikon you used to capture these awesome pictures? Nice video, I finally find your website. I saw a video of you taking photos of your cat flying! We don’t get snow. What are some rainy day photography tips? verry intresting subject for learning photography. I believe the Book is really cool !!! But I think $97 is a bit too much. If the price would be 20 bucks – I will be happy to pay … and I guess many other people are thinking the same way. Probably selling more for smaller price will give you bigger income at the end. Thank you very much for all your great work you are doing !!! RESPECT !!! Ok, seriously you are awesome! 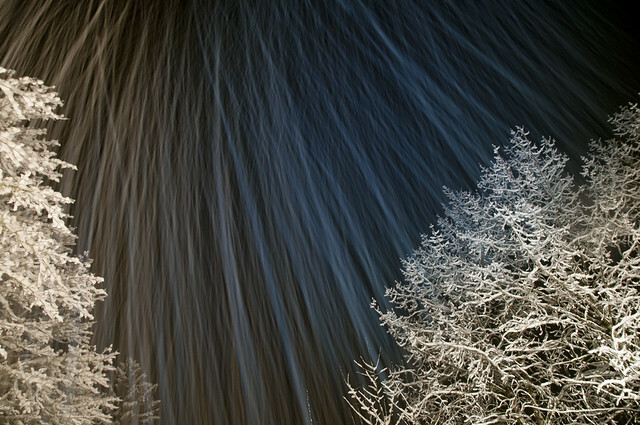 I am in love with the long exposure snow images. Gorgeous! Thank you for the tips! Your enthusiasm rejuvenates me into getting out of whatever rut or commonality one can lapse into. Over all it’s light we work with and the camera is our tool to alter it. In I’ll be retiring in (4 months) from my parking cars and will to get back to adding or hindering light sources. But darn, why does that LED flash light have cost $300! I have used a Coleman Lantern with reflector to light tunnels & caves in “total” blackness, 30 minute exposures w/ Kodachrome, problem was after exposure and shutting down the lantern, then finding your camera in “total” darkness. Evan==Just had to write and let you know how much enjoyment I’ve gotten from your book. It seemed that every page was overflowing with new info and techniques! hi , where are you I miss your videos . i love your work. I’ve finally been able to sit down and watch some of your videos/tutorials. Although some/most of the techniques you have are definitely above my head, as I am still in the very beginnings of learning how to use my camera. (Seriously, all my cameras up until now have been point and shoot.) I still have no idea what aperture and all that fun stuff is. My reason for leaving a comment today is I am wondering if you have a site where your are selling some of your shots. 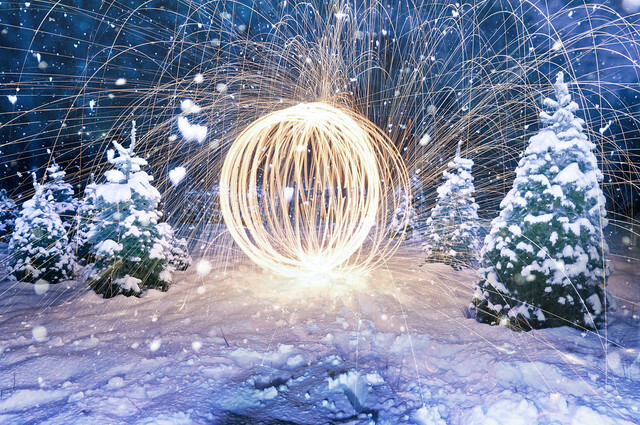 I LOVE these snow flakes and steal wool shots and would like nothing more to have a collage of them up on one of my walls. I’m from Canada where we get a lot of snow, and I have to say that I LOVE, LOVE, LOVE these images. It really doesn’t surprise me that, along with people wanting to buy your book, they would also love to buy some of your actual images. They’re beautiful. Dude just want to say thanks for vids….they gave me lots of ideas….i am new to photography and i am loving the hell out of it!!!! I have tried light painting…pretty cool!!!! thanks for being an insperation. Evan nicely done! Enthusiasm for your subject goes a long way in counter-balancing the stereotype of slick professionally done video productions. I like your way of being yourself. It is like you are talking to me directly without the TV news readers who are reading from a teleprompter with their plastic smile and demeanor. You really connect with your audience by being yourself – talking about what you know – what you have learned by showing us how it is done in real time. Brilliant! Also – I just bought your “Trick Photography and Special Effect”. Love the interactive format of you eBook with video links. Wishing you the best of success and a bright future. 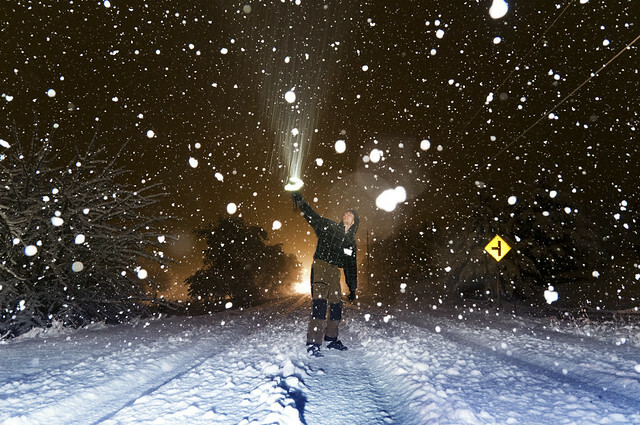 I picked up this multi-color LED flashlight from Think Geek for experimenting with light painting in the snow. It isn’t anywhere near 1000 lumens, but the ability to have so many colors in one small device made it worth trying. Hey, sorry to bother. Im currently using a Canon T4i (650d) and I’ve been testing star trails and it seemed like it stopped taking a picture after 99 minuites and I’m just wondering if it just failed to show or is there a shutter limit of some sort. Like the number of minuites was blnking every second and it stopped on 99 minuites. Im not sure if it just cant show the numbers past three digits or what ?? sorry if this doesnt really make sense, I’m 15 and very new to photography but I’m rapidly learning my way around. Trying to register after purcasing your Trick Photography and Special Effects and it won’t let me. I’ve purchased your product in the first I did last January and so far I did not get my product I want to send me my product or my money I ask to reply as soon as possible so as not to use other ways to return my money. I have the similar comment with Mina. I made the online payment just about an hour ago but still no news of receiving the eBook Trick Photography and Special Effects. Can someone help please? I wrote an email about a similar problem I faced in accesing the eBook to Evan at this address: trickphotographybook@gmail.com. I got a reply with a link where I was able to download the eBook. If you are still having problems please write to Evan using the above email. 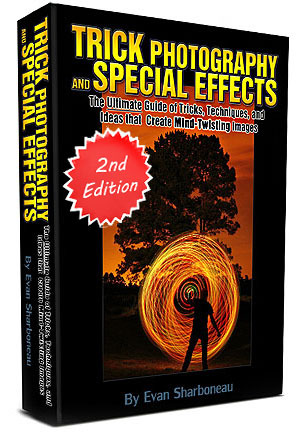 trick photography ebook. i also paid for it a while back and have not gotten a link where i can down load it. i see other people are having the same problem. what do you suggest we do? Roxanna, please email trickphotographybook@gmail.com to get links to download the product. Nice photo Look forward your new photo. Picture is so excellent .Good photograph catching balance/contrast between the brights and dim. Which Polaroid you have been alluded .I am additionally an expert photographic artist. привет. мне понравилось идея с фонарем. попробую ее развить до совершенства у себя! спасибо . Nice tutorial. I have a high end panasonic point and shoot camera. It has amazing quality and build. Can I use it in place of Digital Camera?